I visited Joe's Valley last weekend with Pat and Noah. On the way we were stopped on I-70 for 2.5 hours around 1 AM in the morning, Utah time. A double-semi trailer had collided with a single-semi trailer leaving carnage along the highway, meanwhile leaving us to wait, less than 2 hours from our destination. We met a guy that we ended up calling Homeboy. Homeboy was a sketchy character, our determination based on the fact that he was helping to clear the wreck with a shovel as an excuse to not look suspicious. 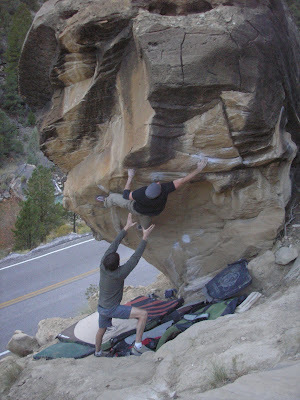 On the first day we climbed on Team Effort, a steep compression prow on a hillside up the right fork. I did Team Effort 2nd try with Noah finishing the climb shortly thereafter. We met this guy James from SLC who was really chill. After that Pat and Noah climbed on the heinously sharp crimps of Jitterbug Perfume. I chose to stand aside and watch this time. We finished out the day climbing on Worst Case Scenario and They Call Him Jordan, both classics in the Left Fork. 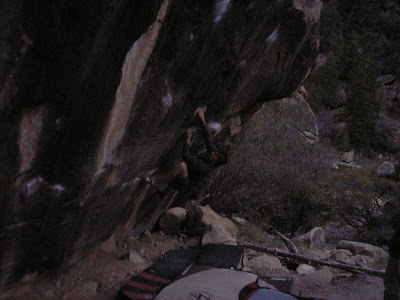 The next day we got on The Wind Below, a classic highball, which is one of the better boulder problems I have ever tried. A Ronin, Shogun, and 4 other pads under this climb still didn't seem like enough. The last day Noah and I flailed on the giant tufa that forms The Worm Turns. I'm psyched to get back to Joe's to finish some projects, explore new boulders, and build landings for new and existing problems. I got to see some good friends that I haven't seen in months or years this last weekend, and hopefully I'll get back to Joe's in March.